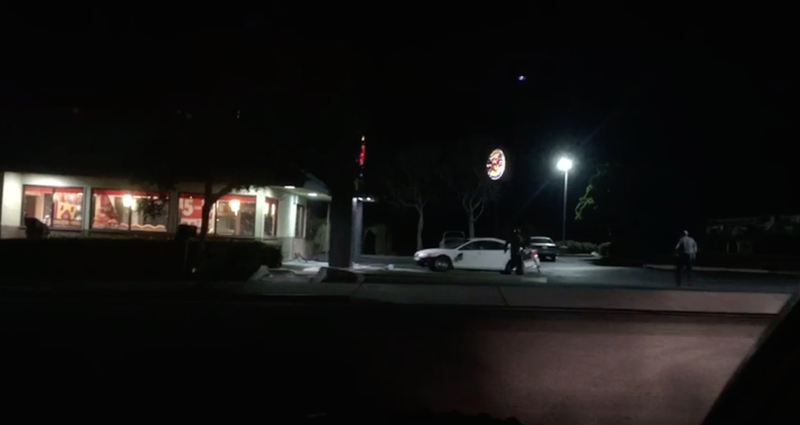 Following an alleged prank call at the Morro Bay Burger King on Saturday evening, a restaurant employee crashed his car through the front entrance and then crashed into part of the drive through. Employees claim they began breaking out restaurant windows after receiving the prank call from a person who said there was a gas leak at the Burger King. Employees then broke out more than a dozen windows and one employee crashed his dodge through the front doors, allegedly to provide ventilation. Brian Jagger was driving by and caught part of the action on video. The Morro Bay public safety team, including both the police and fire departments, responded to the possible gas leak. However, upon arrival, fire fighters found the damage to the facility but no gas leak. Get breaking news, like CCN on Facebook. Subjects: Fast Food Morro Bay Morro Bay Police Department What? The guy who crashed his car into the Burger King is a special kind of stupid. “I totaled my car for nothing? ?” he says. I hope someone sends that video to his insurance company and they deny his claim. Because Adam Hill was choking down a Whopper (now come on–that’s a burger people!) at the Morro Bay BK at that particular time, the plausibility of a possible gas leak was substantially increased. Attention all Burger King, McDonald’s, Subway, Foster’s Freeze, Roundtable, and Domino’s employees of Morro Bay: this is not a prank. There is a leak in the American conscience and you are all hereby, on the authority of The U.S. Department of Dignity, ordered to immediately abandon your posts with their insulting pay and stupid uniforms, and to break a few windows on the way out. Hey, Burger King employees, you have just won the lottery in Nigeria, however, since my great uncle is the king over there, they give me the money and I pass it on to you. All I need before the $22 million can be transferred to your account is a $10,000 cashiers check mailed to this address, P.O.Box 5150, San Luis Obispo, CA. Felony vandalism. Doubt they will be laughing after they hear that. Doubt “who” will be laughing? Let’s all show up for the morning’s Grand Reopening to show support for a local business that puts our developmentally disabled population to work and adds meaning to their lives. Do we need to ask why this group is working for minimum wage? NO. We know the answer to that question. Perhaps this has something to do with the January 1st minimum wage hike to $10. Cut hours, perhaps?